On the 6th of June 2018, Oleon officially opened its new isostearic acid production unit in the presence of Philippe Muyters, Flemish Minister for Work, Innovation, Sport & Economy and CEO of Avril Jean-Philippe Puig. The new unit, which will produce Isostearic acid and Dimers, has a yearly production capacity of 14.125 tons. This will double Oleon’s worldwide market share within this business segment to around 30%. Oleon started the project in June 2016. Until the completion of the new unit, around 500 employees and contractors helped build it. 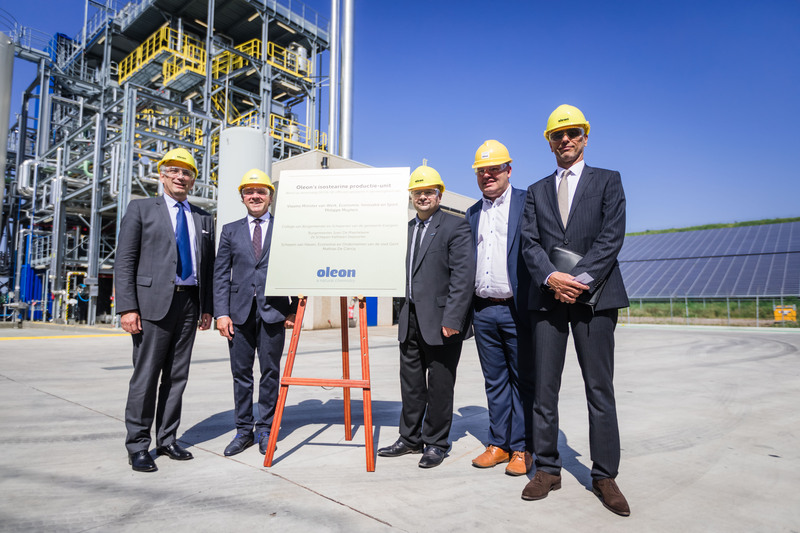 With an investment of around 20 million euro, the new production unit is part of Oleon’s advanced oleochemical solutions it wishes to provide its customers. Isostearic acid, also known as the ideal fatty acid, is a lightly-branched, liquid fatty acid. It is the product of a reaction between oleic acid and natural mineral catalyst. Isostearic acid is 100% natural and vegetable since it is solely based on the parent oil and requires no chemical additions. Isostearic acid is used in a wide range of applications because of its exceptional stability. The product is thermal and odor resistant, proving to be great for cosmetic formulations and lubricants. Isostearic acid has also proven to provide oxidation stability for products with long shelf-life requirements. Moreover, the product is known to have an exceptionally low cloud point, making it easily processable. Dimer acids are molecules derived from soft oils. They are widely used as hydrophobic building blocks for polyamides, polyesters and epoxy resins because they have some very interesting properties. Dimer acids are water repellent and therefore also offer protection against corrosion. They are very flexible and resistant to stress, even at low temperatures. Moreover, they make sure pigment is evenly spread in the final application, they have universal adhesion properties and are also very stable, their properties won’t be influenced by UV-radiation. That is what makes them the perfect building blocks for multiple applications. The new production unit is an example of a remarkable piece of oleochemical technology, since Oleon’s R&D team succeeded in optimizing the isostearic acid production process. By carefully examining and improving the process, they more than doubled the amount of isostearic acid obtained (from 15 to 38%) at the end of the process. Another reason why the new unit is considered innovative, is the fact that sunflower oil is used as a raw material, while the classic process uses rapeseed oil. “This new unit enables us to offer our clients biodegradable isostearic acid and dimers of an even higher performance level. They are the perfect building blocks for high-end applications such as cosmetics. Oleon keeps having a pioneer role in the development of innovative solutions for more sustainable products”, according to Managing Director Base Oleochemicals Eddy Feijen. CEO of Avril Jean-Philippe Puig, Flemish Minister for Work, Environment, Innovation and Sports Philippe Muyters, Managing Director Base Oleochemicals Eddy Feijen, Major of Evergem Joeri De Maertelaere & CEO of Oleon Moussa Naciri. Spread our natural chemistry these Holidays!